It’s been a long time coming, but we’re finally approaching the final stages of our epic living room makeover project! We can hardly believe it! When we say “a long time coming,” we’re not joking. It’s actually been close to a year since the whole thing began. That’s the trouble with taking on large DIY projects: they take time. Time, however, isn’t always easy to come by, what with work and babies and nap times. 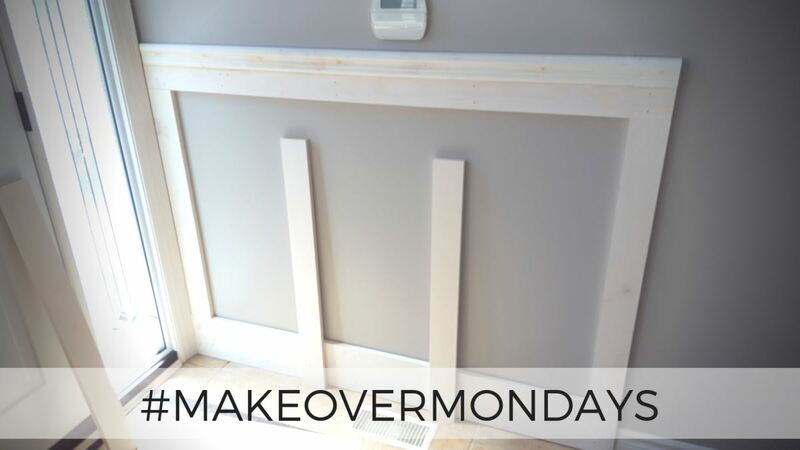 But persistence (and some insistence) pays off, and as we’re entering the home stretch we thought it would be fun to share a weekly #MakeoverMondays post with our readers, and show off the various stages of the project. We can’t give an accurate timeline for each phase of the project, because some stages actually just sort of sat dormant for a couple of months while we got accustomed to the new little life in our midst. And also January is a REALLY cold season to be out in the garage cutting trim. Add to that the fact that Thanksgiving and Christmas are coming up fast, Steve is about to go back to work full-time, and he’s scheduled for a shoulder decompression in mid-October. This makes for a much more condensed timeline on the horizon, so it’s more important than ever that we put the pedal to the metal and get this thing done! 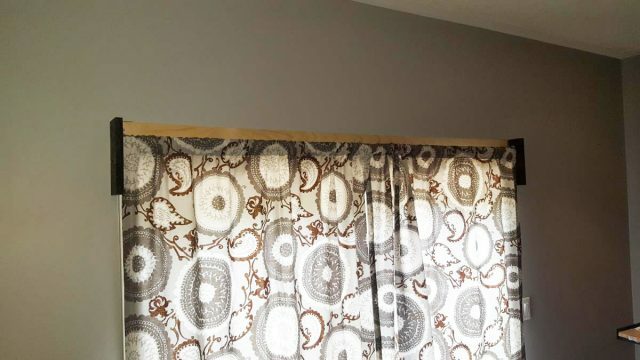 But what the heck…let’s go back to last summer and start with the very first project: our DIY valance for above the patio doors. Before our trip to Ireland last summer, and WAY before we started messing around with installations in the living room, we decided we needed to dress up the doors to the back deck. 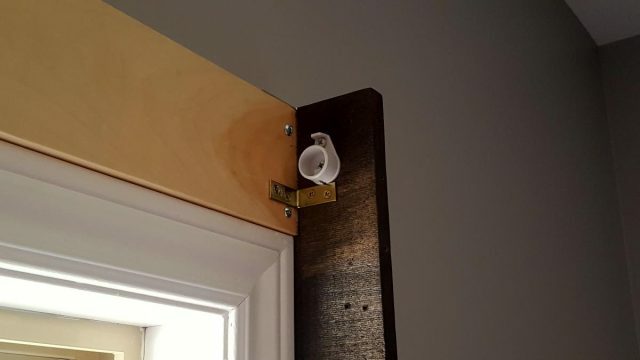 On trend right now is the revival of an old decor item, something that used to be everywhere but now seems to have become less popular as people have been looking to open spaces up. By contrast, we were looking to make our wide-open open concept space a little more cozy, so we brought it back to our space. 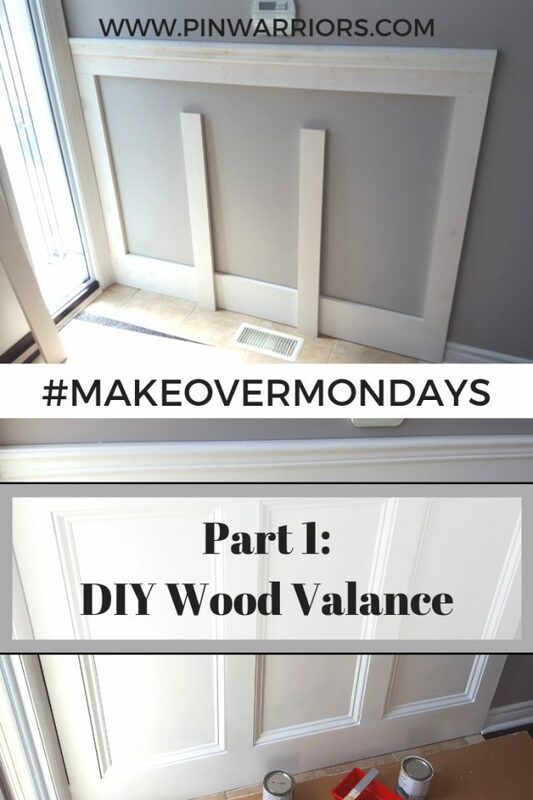 We came across several valance ideas on Pinterest, and figured, sure…this should be easy! It was, actually. A little tricky to get in some of the tighter angles, but overall it was probably not more than three days of actual work. We started by measuring out the width of the door frame itself. 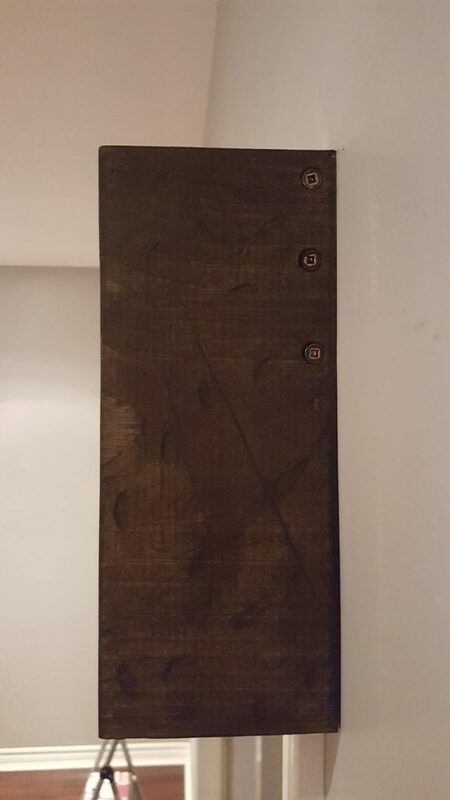 We cut a piece of 1×4 pine to length, and anchored it to the wall, taking care to make sure it was both level and in the studs. Studs on this wall are less evenly spaced than they should be, so we made sure to use really solid anchors. 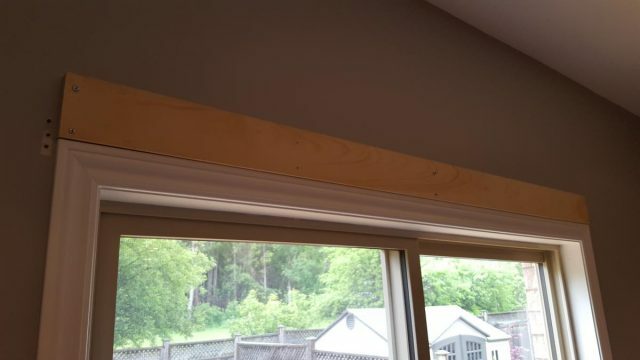 This ledger board wasn’t finished in any way, because it would be hidden. 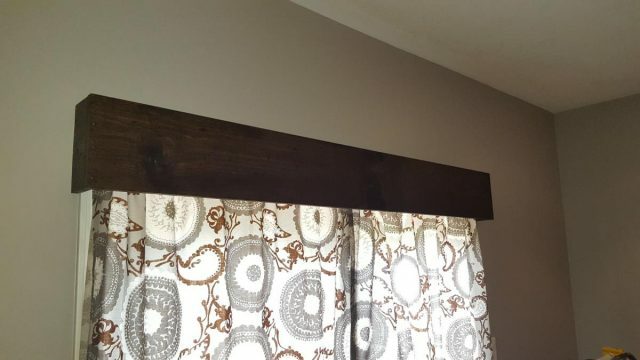 Next, some quick math: the width of the ledger board, plus the thickness of two pieces of wood (surfaced lumber that reads 1″ thick is actually 3/4″) should be the total width of the valance itself. So in this case, it was ledger board + 1.5″. That gave us the length of the 1×8 piece that would become the front face of the valance. 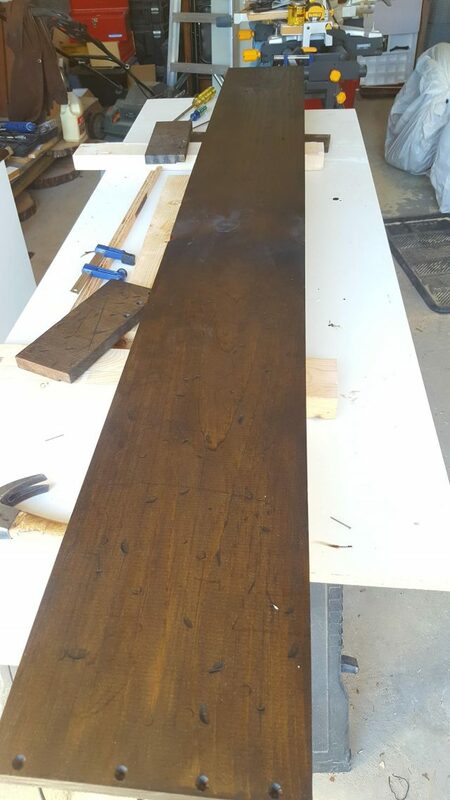 We cut that piece to length, then cut two more pieces of 1×8 4″ deep to make the sides. 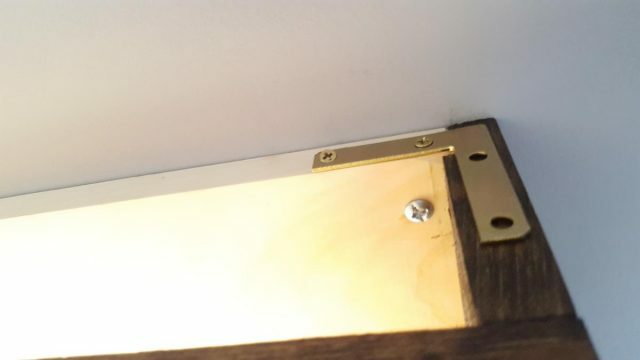 Two deck screws in each side piece into the ends of the ledger board, then four deck screws through the face of the valance into the edges of the side pieces. This setup fit perfectly, except for a minor adjustment on one of the side pieces. Once it was all squared up, it was time to finish it. We wanted an antique look, so we took a hammer and a few other tools and banged up the surface to distress it. Then we just gave it two good coats of stain (Jacobean from Minwax). We decided not to do a varnish or poly coat on it, and just let it hang as it was. We did have to do the insides of the face and side pieces, however, as they’re visible from the outside when the curtains are open. Make a note of that! 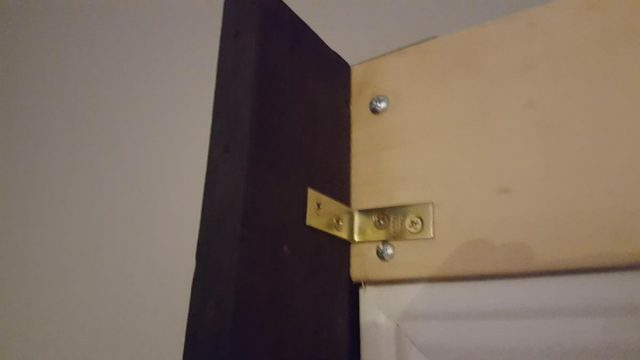 We secured the side pieces back to the ledger board using deck screws, and added in both a flat L-bracket on the top, and an inside corner bracket inside the unit. We figured the screws would be enough to hold the face on, but we didn’t want everything ripping away from the wall. With that in place, all that was left was to put on the curtains and hang the face board. The finished product, we hope you’ll agree, is a pretty great thing. We’re especially excited because now there’s a sturdy piece of lumber there to hang garlands on for Christmas (or Thanksgiving, as you can see HERE)!! 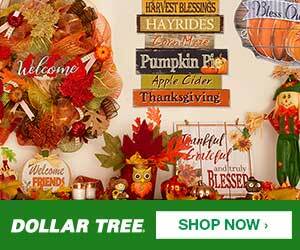 How are your room makeover projects going? Let us know what you’re up to, and what you think of ours, in the comments!